Our friends at TVape.com kindly sent over one of the new Zeus Arc GT vaporizers for us to check out. 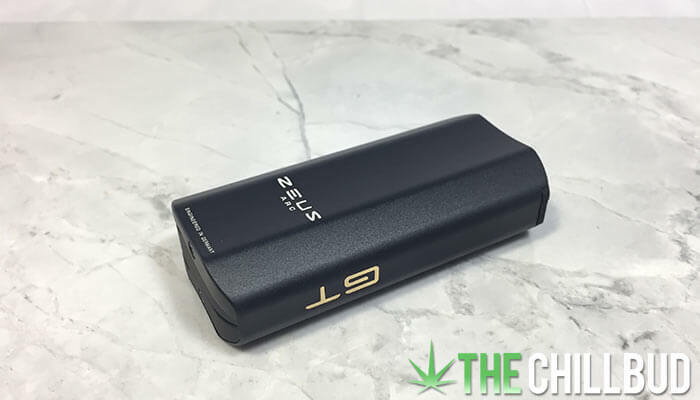 Zeus is a vaporizer brand that offers vaporizers at different price points, as well as all the accessories you’ll need to vaporizer herb like a pro. 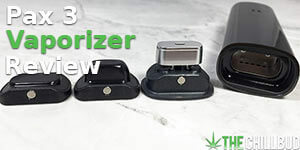 We’ve had the pleasure of checking out some of their products before, but we were really excited about the Arc because it’s their top of the line vaporizer. The Zeus Arc GT is the more luxurious version of the more modest Zeus Arc, boasting some gold highlights and more stylish features. 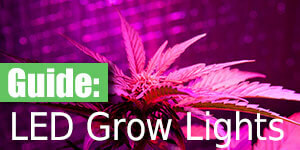 The Arc GT will set you back $229 USD, a fair price considering how well this vaporizer performs. Vapor quality is always the most important aspect of a vaporizer, and the Zeus Arc really delivered! Because the oven is so close in proximity to the mouthpiece, you can end up with some fairly hot vapor if you’re regularly pulling on the Arc. I couldn’t see using this vaporizer with a group of friends, but for a leisurely solo session or with one friend the Zeus Arc would work perfectly. 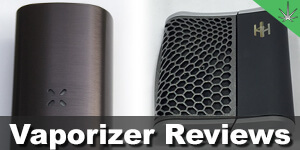 Build quality is another very important factor when considering a vaporizer. 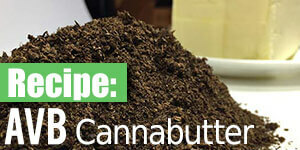 A portable vaporizer should be sturdy and shouldn’t rattle around in your pocket. Once again the Arc delivered on this front. It has a nice weight, very solid feel and is compact enough to fit in the palm of your hand. As far as ease of use goes Zeus did a great job. There’s only one button on the vaporizer and a few lights on the bottom of the unit that let you know when it’s on, heating and which of the three temperatures you have selected. Virtually anyone could pick this thing up and know how to use it in a matter of moments. More and more vape companies are including oven spacers to allow users to pack a smaller bowl and still get good performance out of their vape. Zeus includes a glass spacer screen that essentially halves the size of the oven, perfect for a light solo session. The Zeus Arc GT boasts a long-lasting 90-minute battery life and heats up in ~80 seconds. The whole thing is easily taken apart for cleaning / packing purposes. 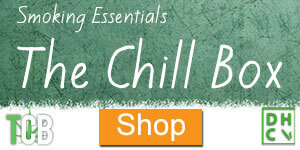 Again, the whole unit is very straightforward and simple to operate, even if you’re brand new to vaping. After seeing how well built the Arc was, it’s no surprise to see that Zeus Arsenal offers a one time hassle-free warranty replacement as well as a 3-year limited warranty on the Arc. 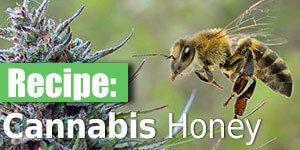 Great peace of mind if you were on the fence about spending $200+ on a vaporizer. 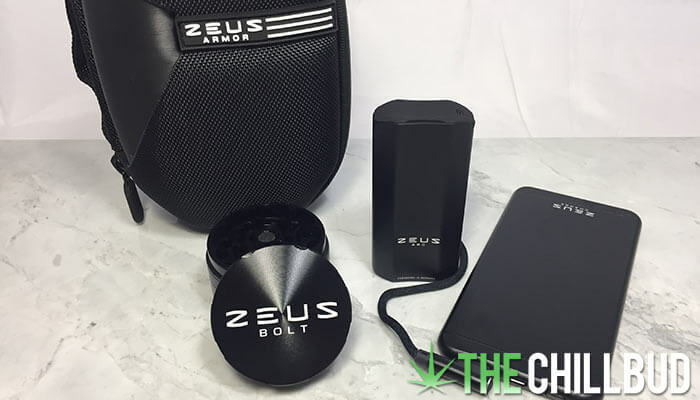 Whether you’re looking for extra battery life on the go, the perfect grind for your herb or a protective case for all your vaporizing goodies, Zeus has you covered. 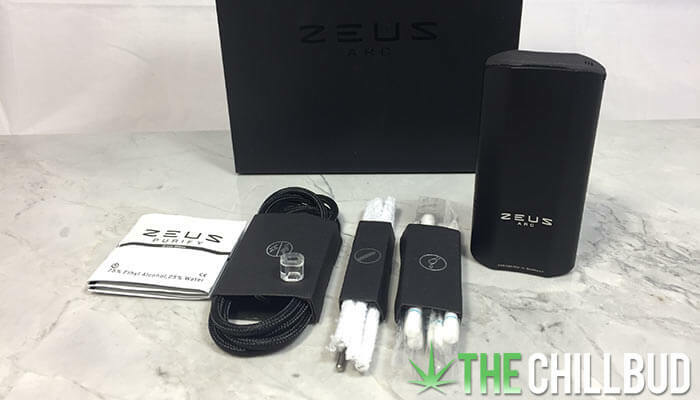 Check out of a few of Zeus’ accessories below to get the ultimate vaporizing experience with your Arc GT. The Bolt a quality grinder made from anodized aircraft grade aluminum and diamond cut teeth. It comes with a hard carrying case to minimize the smell of herb while carrying it around, and even comes with a mini shovel in the bottom compartment for your kief! The Zeus Armor is the perfect carrying case for your vaporizer (not just the Arc) as well as grinder and extra herb. 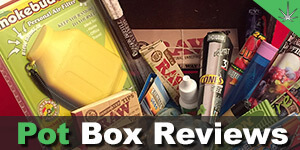 It’s compatible with dozens of leading vaporizers with loads of nifty compartments and dividers. A hard shell will keep your goods safe and all in one place, with a tight sealing zipper to keep the smell inside. This slim battery bank allows you to charge your vaporizer when a power outlet isn’t available. It fits perfectly in the Armor case, or you can simply throw it in your pocket as it’s the size of a typical smartphone. With 5000mAh of power it allows you to vape non-stop no matter where you find yourself.